There could be something self-satisfied and smug about the psalmist, who it seems has accomplished all these things. Though perhaps he only acknowledges what it must be like to have achieved this way of life. The psalmist is clear that to live in the presence of the Lord is the most desirable thing. How wonderful it is that God allows us this privilege, always, everywhere, when we raise our minds and hearts to him. Even when we live lives fogged by ambiguity and weakness, he does not leave us to our own devices. He is close offering encouragement, healing, hope – through the presence of the Lord even the unjust can learn to live. In God’s love for us is our hope, now and always. 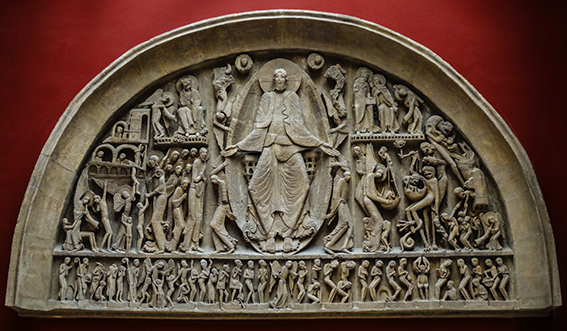 Last Judgement from Cathedral of Saint-Lazare, Autun. Plaster cast in the Cité de l’Architecture et du Patrimoine, Paris. (c) 2014, Allen Morris.